The Saildrone research platform is equipped with technologies to collect oceanographic data. Photo credit: Saildrone Inc.
NOAA Research and NOAA Fisheries have teamed up with academic and private sector partners to test innovative technologies that, if successful, will enable researchers to gather information in areas of the ocean virtually off limits to standard research vessels. Scientists will be using a novel research platform that resembles a windsurfer, called a Saildrone, developed by Saildrone, Inc. Scientists and engineers equipped two of these autonomous, wind- and solar-powered vessels with other newly designed technologies. Their goal is to collect needed oceanographic data and information for endangered and commercially important species living in remote areas of the Bering Sea. "We have high hopes for this mission – that it could mark a new chapter in ocean research," said Christopher Sabine, director, NOAA Research’s Pacific Marine Environmental Laboratory. "Last year, we successfully implemented a 3-month testbed Saildrone mission in the Bering Sea to remotely collect data on physical oceanographic conditions via satellite in near real-time. This summer, we are testing other new technologies in the hopes of demonstrating their efficacy for remotely collecting critical biological data." "As pioneers in this new research frontier we're seeking to discover more cost-effective ways to augment our existing research efforts and gather additional biological information in places that are difficult to navigate with a full-sized research vessel," said Douglas DeMaster, research and center director, NOAA Fisheries' Alaska Fisheries Science Center. conduct detailed prey surveys within the foraging range of a declining population of northern fur seals. 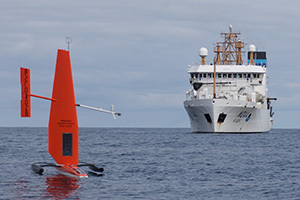 Saildrone and NOAA research vessel Oscar Dyson. Photo credit: NOAA Fisheries. The mission unites scientists and engineers from NOAA, the University of Washington, the Joint Institute for the Study of the Atmosphere and the Ocean, Saildrone, Inc., Simrad AS/Kongsberg Maritime, and Greeneridge Sciences, Inc. The marine mammal related research is possible due to the generous support of the Marine Mammal Commission. "This advance in technology and science is the result of a sustained partnership between the NOAA laboratories and the University of Washington and reflects the talent and quality of the engineers and scientists involved in the project. Understanding climate change in the Arctic requires new tools and innovative measurements and we are all pleased to be part of that effort. We look forward to the results of this summer's campaign, as well as future measurement campaigns in the Arctic," said Thomas Ackerman, director, Joint Institute for the Study of the Atmosphere and Ocean at the University of Washington. "We expect to learn a lot. We may find that some of these new technologies work well for the planned research, while others may require that we make further refinements. That's the beauty of science -- It’s an evolutionary process," said DeMaster. "It's the possibilities that are exciting and the potential to further scientific understanding with the help of innovative new tools," added Sabine. "We look forward to sharing what we learn this summer." Regular updates about the mission progress will be posted on both the NOAA Research's Pacific Marine Environmental Laboratory Innovative Technology for Arctic Exploration website and NOAA Fisheries' Alaska Fisheries Science Center website throughout the project duration. Saildrone. Photo credit: Saildrone Inc. While in this area, NOAA Fisheries' Alaska Fisheries Science Center marine mammal biologists plan to use a modified acoustic tag, AcousondeTM to listen for marine mammals, among them the critically endangered North Pacific right whale. Typically, acoustic tags are attached to whales using suction cups to record the sounds they make. This one was adapted to run on the Saildrone, with the help of Bill Burgess at Greeneridge Sciences, Inc.
Only about 30 of these rare whales are suspected to inhabit the eastern waters of the North Pacific. Although small numbers of these animals have been detected annually in the southeastern Bering Sea since 2007, the full extent of their current range remains unknown. The Saildrones will be able to survey a much larger area than has been previously attainable with traditional methods. 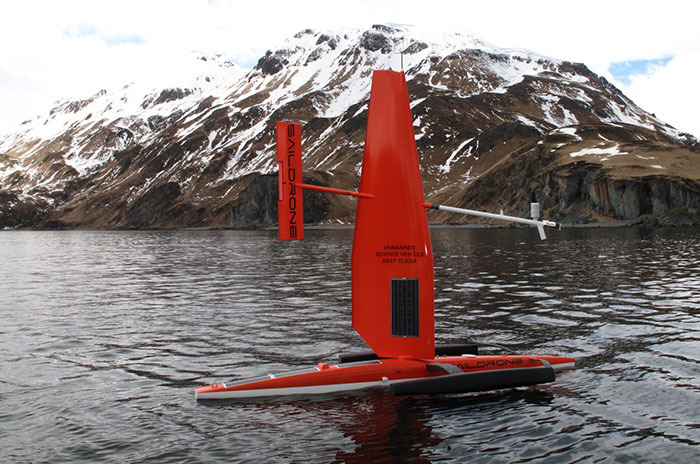 Scientists also plan to test the effectiveness of a state-of-the-art autonomous low-power echo sounder, adapted for Saildrone with the help of Simrad, AS, Kongsberg Maritime. Echo sounders detect fish underwater using sound waves and generate a picture of the sound. 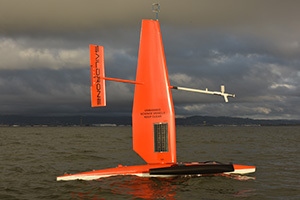 Scientists will compare the Saildrone observations of echoes from fish with those from a larger-scale model currently used on the NOAA research vessel, Oscar Dyson. The goal will be to see how effective the Saildrone echo sounder is at monitoring fish populations. Finally, Alaska Fisheries Science Center marine mammal biologists will integrate satellite tracking of northern fur seals with the echo sounder data to increase our understanding of relationships between fur seals and their primary prey, walleye pollock. Northern fur seal populations in Alaska have been experiencing an unexplained population decline since the mid-1970s and these data are critical to understand how the distribution and abundance of walleye pollock influence fur seal behavior, foraging success, and demographics. To listen to the recording download this MP3.